Cutter – A veterinarian, specifically, though not always, referring to one that spays or neuters cats. Fresh-kill – A recently killed prey animal caught for the purpose of consumption. Fresh-kill is hunted by warriors and apprentices, and placed on the fresh-kill pile or brought to the elders. Elders, kits, queens, and sick cats eat first, then warriors and apprentices. Extras stay in the fresh-kill pile. Gathering – The monthly meeting of all the Clans when the moon is full, at either Fourtrees or the Island. There is a truce on this night, and no fighting is allowed. Greenleaf Twolegplace – A place frequented by Twolegs during summer, such as a resort or camping spot near the lake. Horseplace – A place where horses are kept, such as ranches and stables. Hunting Patrol – A group of cats hunting for fresh-kill to bring back for their Clan to eat. May fight if there are trespassers. Kittypet – A domesticated pet cat. Thunderpath. Motorboats are sometimes referred to as "water-monsters." Moonpool – The place near the Lake where medicine cats and leaders share tongues with StarClan. Rogue – A usually hostile cat who does not have a permanent home, roams around, and does not care about crossing Clan boundaries. Sharing tongues – Cats grooming each other while sharing the latest gossip. A cat lies on the ground, talking, while the other grooms their fur, listening. She-cat - A female cat. She-kit - A female kit. Silverpelt – The large swath of stars in the sky (the Milky Way). These stars are a direct representation of StarClan. Snowmelt - A term used to describe slush or dirty, melted snow. Sun-drown-place - An ocean to the west of the Clans' territories. Thunderpath – A paved road with an extremely acrid smell that cars often go across. Tom/tomcat - A male cat. Twoleg kit – A human child. Twoleg nest – A human's house. Twolegplace – A town, city, or village where Twolegs live. Newleaf - The season of spring. Greenleaf - The season of summer. Leaf-fall - The season of autumn or fall. Leaf-bare - The season of winter. Moon - The time between one full moon and the next, spanning about 29 days, a month. Moonhigh - When the moon is the highest in the sky; about midnight. Moonrise - The time when the moon rises. Half-moon - About two weeks, half a month. Quarter-moon - About a week. Sunhigh - The point during the day when the sun is highest in the sky; noon. Sunrise - One day in cat time (i.e. One sunrise ago). Season - A quarter of a year in cat time. Four seasons equal a year. Heartbeat - A split second. Claw-moon - When the moon resembles the shape of an unsheathed claw, equivalent to crescent moon. Sunup - Dawn. However, Dawn is still used for example in the phrase "Dawn Patrol." As easy as swallowing a minnow - A phrase used to indicate easiness of the task. As much use as a dead fox - A (harsh) insult, meaning the recipient is useless. Crowfood - A (harsh) insult comparing the recipient to rotting prey animals (as in I'll turn you into crowfood! ), or suggesting that they eat it (as in crowfood-eater). (You're) crazier than a fox in a fit! - An insult used when a cat (or cats) are acting crazy. Another variation uses "madder" instead of "crazier." Doesn't matter a whisker/Doesn't catch so much as a whisker - An exclamation meaning the cat does not care, (i.e. it didn't matter a whisker that she didn't share their beliefs) similar to I don't give a mousetail. Or saying that a patrol didn't catch anything. Doormouse - An expression or exclamation used against a cat who sleeps a lot. Drypaw - A cat that dislikes getting wet, usually used in RiverClan. Like LionClan/TigerClan - An expression stating that a cat does something very fiercely or well. Flea-brain - A (friendly, yet harsh) insult. Severity of the insult is almost always decided by tone. Frog-dung - Same as fox-dung, except it's often used in RiverClan. Fox-hearted - An insult meaning cruel, cold-hearted, or evil (as in fox-hearted Twolegs). Furball - A (friendly, yet harsh) insult. Severity of the insult is almost always decided by tone. Fuzz-brain - A (friendly, but harsh) insult. Severity of the insult is almost always decided by tone. 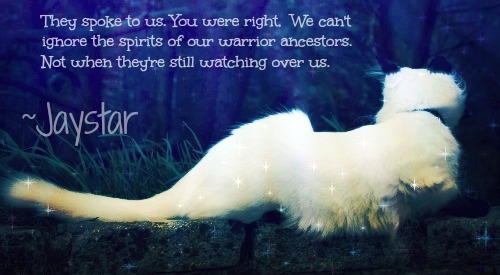 Great StarClan! - An exclamation used to signify extreme surprise or anger. Similar to Oh my god! in usage and to the fact that they both have mention of a higher force. Hare-dung - Used as an exclaimation, similar to "mouse-dung". Somewhat like "Darn it!" When hedgehogs will fly - An exclamation style statement that shows disbelief that a certain event will likely occur (as in That will happen when hedgehogs fly), used in many variations. Somewhat like the human phrase, When pigs fly! How in Silverpelt? - An exclamation used meaning "How in the world?" I don't give a mousetail/They wouldn't give a mousetail - An exclamation meaning that the cat does not care. Another variation is I would ____ for a couple of mousetails meaning that they are willing to do the inserted action for no real reward. Can also mean that a cat would be stingy enough not to share a mousetail. I'd have shredded you into mousedust! - to gravely injure, rip to shreds. Similar to mousemeat. Make dirt - to use the bathroom. May StarClan light your path/Banish all the fleas from your nest - A friendly term used to tell others they wish them well. May the Sun warm your back and the fish leap into your paws - A blessing used in RiverClan used to wish good dreams or, in some instances, to say farewell to a dead cat. Minnow-brain - An insult that is friendly but harsh. A RiverClan version of mouse-brain. Mouse-brain - A (friendly yet harsh) insult. Severity of the insult is almost always decided by tone. Mouse-dung - A (somewhat harsh) insult comparing the recipient to mouse feces. Also used as an exclamation (as in Mousedung! That can't be right!). Somewhat like "Darn it!" Mouse-hearted - An insult that describes one who is cowardly. Mousefodder - An insult describing that the cat is worthless or a kittypet. Once a kittypet, always a kittypet! - A harsh phrase used to describe a cat with kittypet roots. answer. Similar to "Only god knows what," "Only god knows," and "god knows." Pain in the tail - An insult meaning a cat is irritating or lazy. Scaredy-mouse! - A similar expression to scaredy-cat, but in cat terms. Scaredy-sparrow - An expression also similar to scaredy-cat, in cat terms. Snake-hearted - Similar to the term "fox-hearted," generally used by RiverClan. Snake-tongue - An insult meaning cold or unfair; similar to "fox-hearted" or "snake-hearted"
StarClan's kits! – An exclamation of surprise or disbelief. Sometimes used as an exclamation if a cat is hurt. What in StarClan's name?- A exclamation similar to "What on earth?" or "What in the world?" That's a load of badger droppings - A harsh exclamation saying that something is nonsense. Thistles and thorns - Used to describe bad luck (as in: Thistles and thorns! I blew it! ); similar to "Darn it" or "mouse-dung. You fight/hunt like a kittypet! - An expression used to insult or tease a cat who fights/hunts poorly. Would've made mousemeat out of you! - To badly injure, rip to shreds. Similar to mousedust. Rabbit-chasers - A less harsh insult used in ShadowClan to describe WindClan. Camp - The place where a Clan makes their permanent home. Leader's den - The den in camp that belongs to the Clan leader. Medicine cat's den - The den in camp that belongs to the Clan's medicine cat and his or her apprentice. Sometimes referred to as the medicine den. Warriors' den - The den in camp that is shared between the warriors and the deputy of that Clan. Apprentices' den - The den in camp that is shared between the apprentices of that Clan. Elders' den - The den in camp that is shared between the elders of that Clan. Nursery - The den in camp that is shared by the queens and kits of that Clan. Dirtplace – The place near the camp where cats go to urinate or excrete. Fresh-kill pile – The place, usually in the center of the camp, where the warriors drop the prey they caught while hunting, so it is easily accessible to all the cats in the Clan. Carrionplace/Crowfood Disease - no human equivalent; extremely painful stomach flu caused by eating diseased crowfood/prey -causes nausea/vomiting/painful stomach cramps, can kill kits, apprentices, and elders. More often found in ShadowClan. The Sickness - this is our (WML) name reference for the huge breakout of greencough and blackcough which decimated every Clan to about three to four members each. Nofurs- Another word for people. Upwalkers- Another word for people. Blood-beat - A heartbeat detected in a prey item.